Dr Abdullah is an industry professional with more than 25 years of experience in the healthcare and education industry. 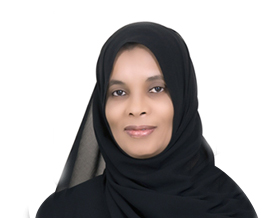 Currently, Dr. Ayesha Abdullah is the Executive Dean of the Business School at Higher College of Technology. In her capacity as the Executive Dean, she is responsible for academic excellence and advancing linkage with industry. Dr. Abdullah was also the Chief Executive Officer of CERT Group of Companies and her role is to advance Applied Research, technology innovations and training and development. She was previously responsible for overseeing an independent regulatory authority for all healthcare providers, medical educational & research institutions and other businesses operating within the Dubai Healthcare City Free Zone. Dr Abdullah previously held the position of the Managing Director of the Science Cluster. She was responsible for managing and formulating the strategic direction of the three major companies in Dubai for the development of the knowledge based economy- namely Dubai Healthcare City Cluster and its subsidiaries, Dubai Biotechnology & Research Park- DuBiotech and Enpark, a Business Park facilitating the growth of energy and environmental businesses. Prior to that Dr Abdullah held the position of CEO of Dubai Healthcare City (DHCC). Under her leadership, DHCC rapidly gained a status as an internationally recognised location of choice for quality healthcare and an integrated centre of excellence for clinical and wellness services, medical education and research. In 2008, DHCC won the Dubai Quality award and the ‘DHCC Out-Patient Quality Standards’ were the first Middle Eastern standards to be accredited by The International Society for Quality in Healthcare (ISQUa). Prior to this, as Chief Executive Officer at the Center for Healthcare Planning and Quality (CPQ), Dr Abdullah was responsible for setting up and upholding healthcare standards within DHCC. She also played a key role in establishing CPQ into a premier regulatory body in the industry. In October 2009, Dr Abdullah received the prestigious ‘Leading Woman CEO’ Award, marking a milestone in her achievements and recognizing her strategic management and leadership acumen that significantly contributed to the healthcare cluster’s growth. She was also awarded the L’ Officiel Arab Women of the Year in 2010. She holds a bachelor’s degree in Biomedical/Electrical Engineering from Wisconsin, USA, an MBA with an emphasis on Finance and a PhD in Strategy Management & Planning Studies from Sheffield University in the UK.